This is a large and bright, well proportioned, front facing double bedroom with a bay window, two alcoves, two radiators and a decorative fireplace. The large double glazed bay window allows for plentiful natural light. A wash basin is also fitted. Dimensions: 16'3" x 15'2" excluding bay window (4.96m x 4.63m). 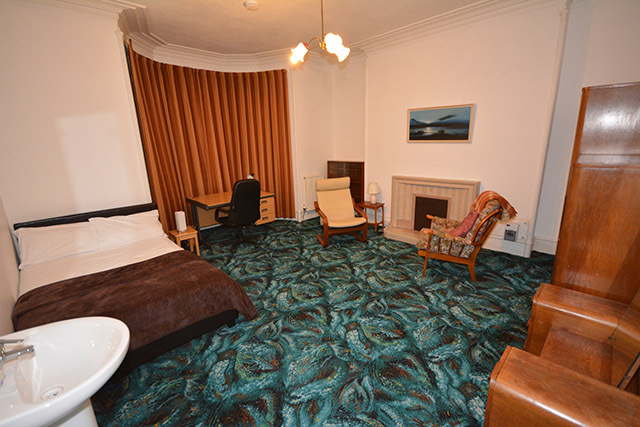 Cost: The all inclusive rental charge is £395 per calendar month which includes room rental and all utilities. Further details of costs. Availability: Room available from 19th May 2019. Bed - Dark brown faux leather Prado small double bed with 20cm (8") memory foam mattress. This mattress is medium firm. Bedding Option - Duvet, two sets of duvet covers, two sets of sheets, two pillows, two sets of pillow cases and a bed throw. One upholstered/fabric easy chair with additional cushion and throw.